The FTE Global Awards celebrate the outstanding efforts of organisations that have gone the extra mile to improve the passenger experience both on the ground and in-flight. 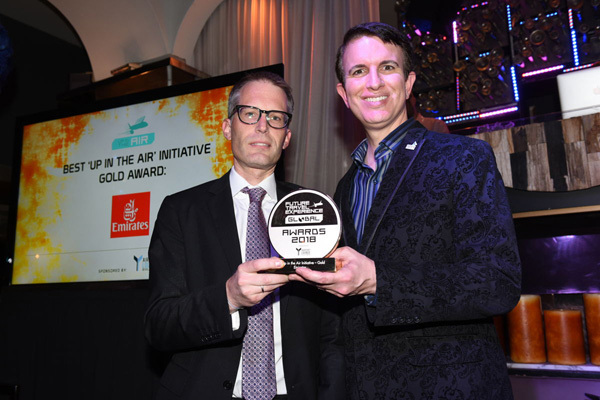 The “Best ‘Up in the Air’ Initiative” category recognises the top three initiatives that have helped to improve the passenger experience and/or significantly enhance operational efficiency during the in-flight phase of the travel process. The awards ceremony took place at Hyde, an indoor-outdoor nightlife venue overlooking the Fountains of Bellagio on the world famous Las Vegas Strip, the evening of September 11. Emirates’ new First Class private suites are the first in the industry to be fully-enclosed with sliding doors that extend to the cabin ceiling, ensuring an unmatched level of privacy. Customers can video call the crew for service requests without leaving the comfort of their suite, and crew can serve drinks and canapes through a special service window without disturbing customers. The 777 First Class Private Suites will also include new Bowers & Wilkins Active Noise Cancelling E1 headphones created exclusively for Emirates. These headphones were designed by award-winning audio brand Bowers & Wilkins to ensure the sound is optimised for the First Class cabin environment. In addition, each suite is fitted with an inspiration kit which features a luxury Byredo skincare collection found only on Emirates, Hydra Active moisturising pyjamas, and Bulgari amenity kits.